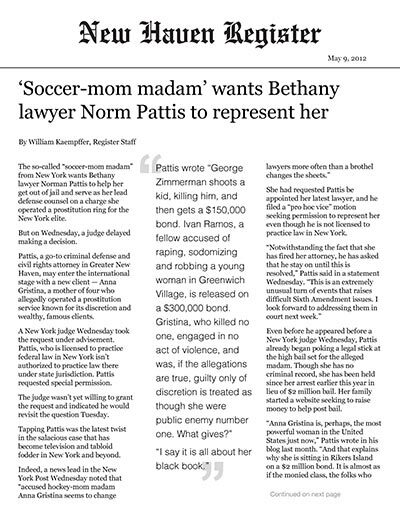 The so-called “soccer-mom madam” from New York wants Bethany lawyer Norman Pattis to help her get out of jail and serve as her lead defense counsel on a charge she operated a prostitution ring for the New York elite. But on Wednesday, a judge delayed making a decision. Pattis, a go-to criminal defense and civil rights attorney in Greater New Haven, may enter the international stage with a new client � Anna Gristina, a mother of four who allegedly operated a prostitution service known for its discretion and wealthy, famous clients. A New York judge Wednesday took the request under advisement. Pattis, who is licensed to practice federal law in New York isn’t authorized to practice law there under state jurisdiction. Pattis requested special permission. The judge wasn’t yet willing to grant the request and indicated he would revisit the question Tuesday. Tapping Pattis was the latest twist in the salacious case that has become television and tabloid fodder in New York and beyond. She had requested Pattis be appointed her latest lawyer, and he filed a “pro hoc vice” motion seeking permission to represent her even though he is not licensed to practice law in New York. Even before he appeared before a New York judge Wednesday, Pattis already began poking a legal stick at the high bail set for the alleged madam. Though she has no criminal record, she has been held since her arrest earlier this year in lieu of $2 million bail. Her family started a website seeking to raise money to help post bail. It was unclear whether the post was written before or after he was initially contacted to represent Gristina. Gristina is charged with one count of promoting prostitution, a class D felony in New York. In his blog, Pattis said most first-time offenders might resolve a case of this sort with a plea and probation. But Pattis opined that most people aren’t Anna Gristina. “You see, she is rumored to be madam to the power elite. Her black book, the list of who’s been naughty, reportedly contained such names as former presidential candidate John Edwards. If you listen to the gossip, Gristina’s been brokering lust to tycoons for many years, amassing a fortune believed to be in the millions of dollars.”He pointed to other high-profile cases, juxtaposing the bails set by judges. Gristina, a native of Scotland, is accused of moonlighting for 15 years as a multimillion-dollar Manhattan madam. From our New Haven, Connecticut base The Pattis & Smith Law Firm represents clients charged with felonies or misdemeanors throughout CT including metro areas of New Haven, Milford, Meriden, Middletown, Bridgeport, Hartford, North Stamford, Stamford, Waterbury, East Norwalk, Norwalk, Danbury, New Britain as well as throughout Fairfield County, New Haven County, Middlesex County, Litchfield County, Hartford County, New London County, Windham County, and elsewhere in Connecticut as well as in New York federal courts.